So one of the #1 things I hear about making changes towards eating healthy is related to money. People often say that eating healthy requires a much bigger budget. But if you have followed my posts over the last couple years then you can see that cooking from scratch with real ingredients (whole foods) is actually cheaper. There are some things that will cost more with being organic, such as a lot of fruits and and vegetables. Grass fed meat and dairy products are more as well. You can save on some things and spend more on others. Figure out what is important to your family and what you eat the most of that is important to go organic (such as grassfed beef and milk for us, but I don’t get organic flour. Some fruits that have a thick skin and aren’t on the “deadly seven” list). But even if you buy non-organic and eat more whole foods you can save money by purchasing fresh or frozen fruits and vegetables rather than boxes of processed food. Another way to save money?? 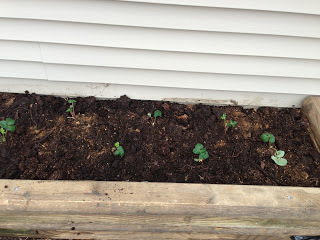 Start a garden! I did 2 years of garden boxes and then took a year off in 2012. 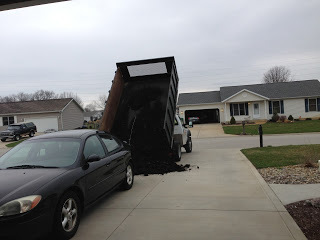 I had to re-coup and figure out what I really wanted to do that would make sense for our family and be cost saving. 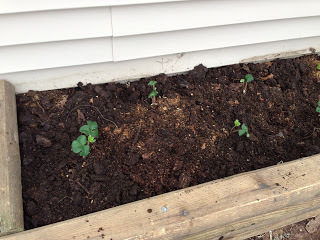 How do you start a garden? First, figure out what you want to do. 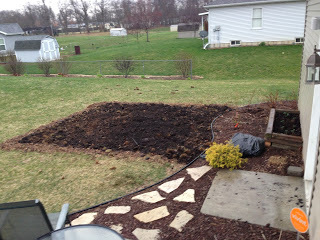 Then figure out how much space it will take up/how much of each you want to plant. 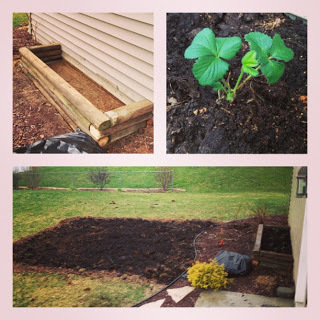 Figure out what type of soil you have to determine if you want it in the ground or raised beds/boxes. 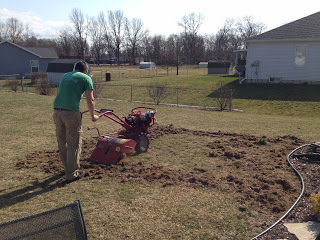 Here he is tilling up the ground. 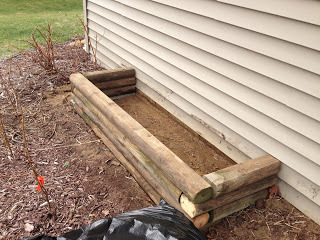 My husband also built a box for me, today, to put my strawberry plants in. Love it. 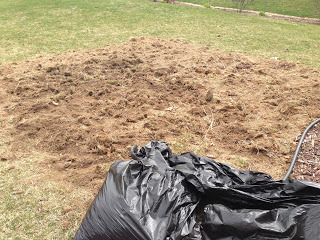 We also got dirt to put on top of the sandy soil. 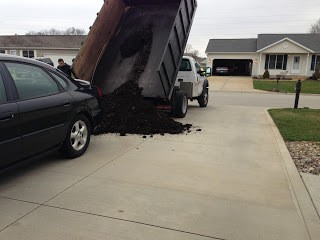 Then I got duck mulch (fertilizer) to mix in with the top soil. I also have mulch to put around the edges of the garden and in between my planted areas to have a path without getting all muddy every time and easier to keep weeds out. 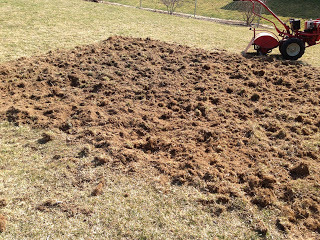 Dirt that I am shoveling into a wheelbarrow and putting in my garden. There are so many benefits to growing your own food. You know where it’s coming from and what you’re putting in it. It’s very fresh if you eat it as it is ready to harvest. It costs a fraction of the price. Once you have a plan, support of your spouse, help from others, it’s fun! 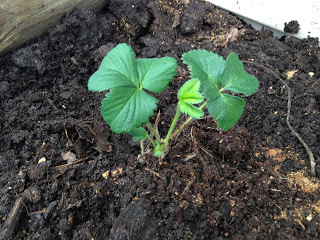 What am I growing and planting? …..each of these will produce every year with good care and don’t need replacing. These fruits save a TON of money. We probably saved hundreds of dollars in raspberries alone last year because we picked bowls of them everyday for months! Most of the things I am planting are on the list of things to buy organically (such as the berries and lettuce) because they are heavily doused with chemicals and the skin gets eaten. So this will be a great way to save and lots of fun to go pick and eat 🙂 Are you doing a garden? What are you planting?